Window Mesh Decorated as Full Color Graphics. Retail Application. Take a look at Ace Hardware’s solution to drawing attention to their 22nd street store. For many of the Ace hardware stores in Tucson, it is not enough to sell the same nuts and bolts as everyone else. 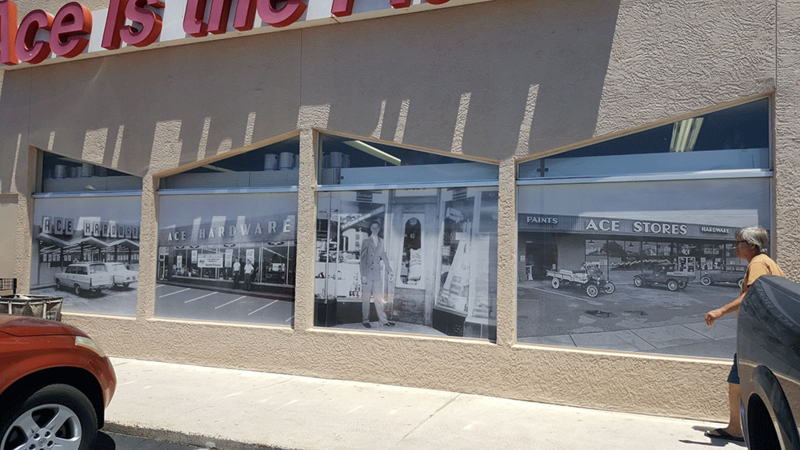 The window mesh or window graphics help to tell the story and attract new customers. Described as mesh vinyl or window mesh because the material has a series of holes. Typically they are in the ratio of 70/30 or 60/40. Mesh banners are digitally printed and can be done in any size. Looking at the font of the window mesh the graphic appears normal. From the back the appearance is much like a tinted window and screens out the sun and heat. This makes it an ideal solution for large windows in direct sun and is often installed in large retail spaces.